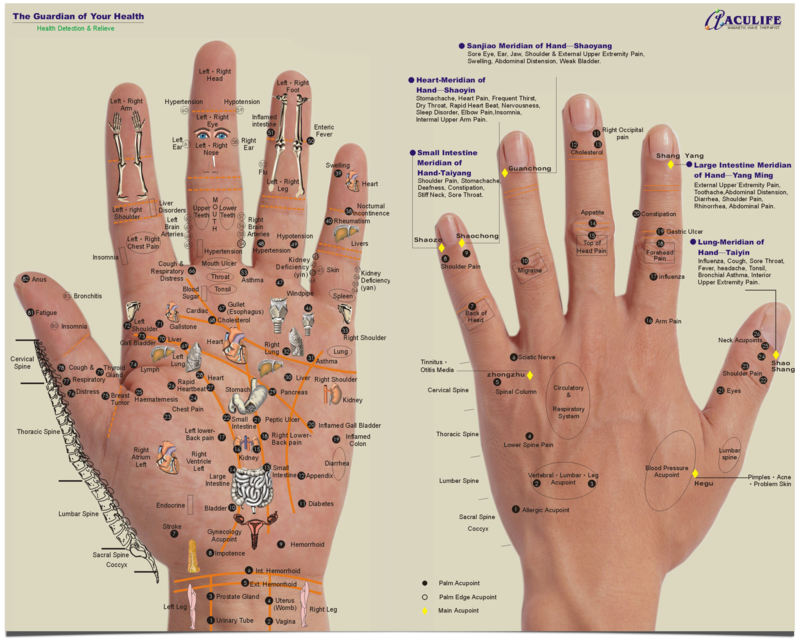 This website is the official site for acquiring the Aculife Hand Acupuncture Manual by Niall Strickland. The ISBN code for the book is 978-0-9562751-0-3. Please note that we do not sell the Aculife Magnetic Wave Therapist device. For your convenience we offer both a hard copy and downloadable PDF version of the book. Simply choose the version that suits you best. Embracing the ancient Chinese tradition of healing, Aculife uses the time-honoured philosophy of Wu Sing, or “five elements”, as the basis of its treatment. The five elemental energies – earth, gold, water, wood and fire – symbolise the life forces present in all living things, each one being a manifestation of Yin and Yang, or the opposing states of nature. Aculife can pick up imbalances in your body by identifying blocked acupoints in your hand. It then works to unblock these acupoints through light stimulation of the hand. It is really simple to use for both detecting problems in the body and for successfully treating underlying conditions. Aculife can treat and relieve the pain for an extensive list of conditions. Also, Aculife can be used by any person young or old at any stage of illness or other treatments with just a few exceptions. It is not a cure-all device but it is extremely beneficial for most people. We have been studying Aculife in common use by thousands of individuals and medical practitioners for more than 8 years. This book delivers the benefits of our experience and shows how easy it is to detect and treat more than 57 different medical conditions. It is simple and easy to understand so that you too can have a good experience with this wonderful electronic acupuncture device. If you already own an Aculife Magnetic Wave Therapist, you really need this book if you want to be able to use the device effectively. Firstly, the pain or problem location is shown on a body figure. This should match the points on your body where pain is located. Secondly, we have broken the treatment points into three different groups which represent the different meridians in your hand. Each group is identifiable on the handmaps by a different symbol; a green circle or oval; a navy blue rectangle and; an orange triangle. At least one point in each of the displayed categories should be treated for 5 minutes in each treatment session. In reality, the points where a user gets the strongest sensation on the hand will always be the correct points for treatment. Thirdly, to simplify locating the correct hand Acupoints, we represent the best treatment points on the front and back of the hand using the symbols described in the previous paragraph. The Acupoints shown are an approximate guide for where you need to place the blue pointing device. Simply seek the points that offer the strongest sensation. Please note that if you have no pain at the moment, then you will not get a strong sensation on the hand Acupoints when using your Aculife device. Similarly, after a treatment you should find that the sensitivity in the hand Acupoints should reduce. Also, try to be patient. Aculife is not a quick-fix device that will immediately solve all of your health problems. Rather, it is a treatment that requires systematic use over a period of two to fourteen days to show significant benefits. Based on the thousands of success stories related to us by regular users of Aculife, we believe that perseverance is well worthwhile.